What was a curse for Kamehameha-Maui turned out to be a boon for Pearl City in the opening round of the Meadow Gold Dairies/HHSAA Division I Girls Soccer State Championships yesterday. 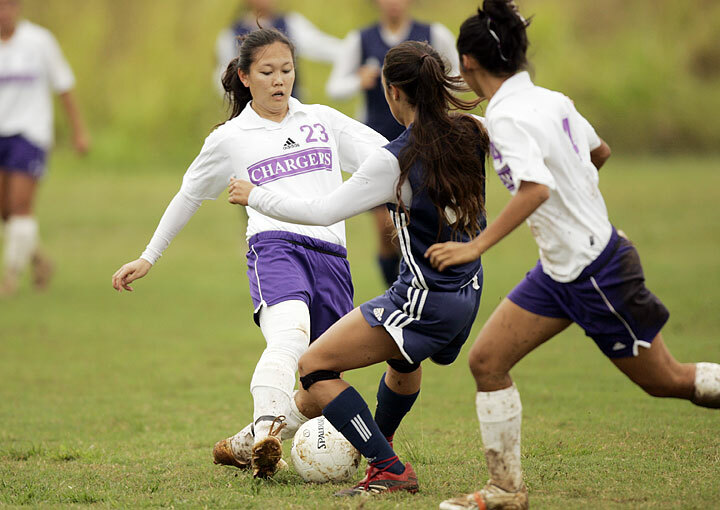 Muddy conditions at the Waipio Peninsula Soccer Park hindered the Warriors' ball movement, but the Chargers (12-2-2) made do and made it to the quarterfinals with a 6-2 victory. "Didn't hurt us today, didn't hurt us at all," said Pearl City coach Frank Baumholtz III. "We adapted to it really well and had much better passing today than what we had in the (Oahu Interscholastic Association) championships, and that made a big difference. Maybe the water in the field slowed the ball down a little bit, because last time there were too many long passes and today they were right there where you could do something with it." The same couldn't be said for the Warriors (10-3-2), the Maui Interscholastic League's second seed. They trailed 2-1 at halftime, but struggled mightily in advancing the ball past midfield in the meaningful moments of the second half. Pearl City, the OIA runner-up, advances to play Konawaena, the Big Island Interscholastic Federation champion, at 1 p.m. in the park's Main Stadium today. The Wildcats (14-1) watched their opponent's dominant win from the sidelines. Kamehameha-Maui coach David Ching suggested his team's familiarity with playing on sports turf hurt when it came to the messy conditions. It was the school's first-ever appearance in the tournament. "We came out hard in the second half and tried to get that equalizer, the one to win it, but things got a little tough, quite muddy out there, we're not used to that," Ching said. Senior defender Kela Lau Hee scored both of Kamehameha-Maui's goals off of assists from Cheynice Ruidas. Lau Hee's first score tied the game at a goal apiece in the 19th minute, but Pearl City celebrated five straight scores until her second connection from Ruidas, a header off a corner kick in the 68th minute. Sophomores Bethany Gallarde and Kaitlyn Holt scored the Chargers' first-half goals, and pressure from Gallarde early in the second half widened the lead. When the Warriors' goalkeeper couldn't cleanly fall on a ball in the muddy penalty box, Gallarde moved in like a hyena and blasted it in for a 3-1 lead at 44:00. Pearl City's aggressiveness forced a deflected own goal on the Warriors 10 minutes later, and junior forward Meghan Fuller followed by blasting the ball into the right side of the net from 30 yards out to make it 5-1 at 61:00. At that point, Baumholtz III inserted most of his reserves. Sophomore Lorial Rosado completed the team's scoring on her first-ever touch in a varsity game when her lob shot from near midfield bounced over the goalkeeper and into the net. "I thought the goalie was gonna get it. I can't describe (the feeling)," she said. Lau Hee's second goal with 12 minutes to play gave the Warriors a boost of confidence heading into their consolation match against Moanalua. "We never gave up, we held our heads up, it was a good experience for us," Ching said. Julia Borges scored in the 46th minute and Jin-ru Schiller added an insurance score at 58:00 to carry the Cougars over the Vikings. Both players are freshman midfielders. Kaiser (10-3-2) takes on OIA champion Kapolei (11-2-3) at 3 p.m. today in the quarterfinals. Tani Costa scored a hat trick and Alexandria Aguirre added two goals in the Falcons' shutout of the Waveriders. Costa scored two goals in rapid succession in the 12th and 13th minutes. The Falcons (11-4-1) take on top MIL seed King Kekaulike (11-1-2) today at 5 p.m.
Chelsey Goo scored the golden goal 1 minute into the second overtime period to help the Trojans outlast Na Menehune. Mililani's Chelsey Miyake broke a scoreless game with a goal in the 68th minute, but Moanalua captain Ashley Dolan answered with the tying score with a minute to play, forcing overtime. The Trojans (12-2-3) face defending state champion Kamehameha (8-0-2) today at 7 p.m.